Our business card design service is completely bespoke and tailored around you and your business. Working closely with you to gain a true understanding of your company and its key statements, we can design your business card as creative as you want it to be and ensure we send the right message to create a positive lasting impression. To complete our design service we also offer first-class lithographic printing in full colour on a range of materials, and with a variety of finishes and specialist enhancements available through our Appletree Print division. To ensure we can meet any request and create your business card exactly how you want it we also provide a range of specialist finishing options, these include... Matt or Gloss Lamination, Rounded Corners, Spot UV, Conquerer Cards and Thick 400gsm. A flimsy card can look cheap and feel “home made” which does not convey a professional message, so our business cards are printed on Luxury 400gsm silk art board, which is then either gloss or matt laminated for FREE, resulting in a high quality finish that stands the test of time against standard thinner, uncoated business cards. For an even greater prestige feel, we also supply a Premier range, which is printed on finest quality Conqueror art boards. We use the highest quality lithographic printing process to ensure quality is very high indeed. Plus we are now printing Spot UV business cards which are the same as our Luxury range but with the addition of a thin varnish applied to an area of the card to highlight certain elements of the card when caught by light. Your creative business card designer will talk in-depth about your requirements, taking into account any ideas you may have. Your business card designer will begin work on your business card design and email you the business card concept board within 48 hours. Once you have viewed the initial concept you may discuss any changes with your business card designer and he/she will continue to revise your business card design until you are happy (unlimited revisions). 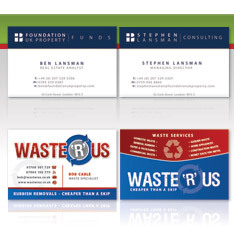 Once you have signed off the business card design, your business card designer will prepare for either print or send. If you have selected printing, your business cards will be printed and sent to you. If you have selected design only, your final business card design will be prepared in high resolution print ready format and emailed to you.